I'd not visited the boat in more than a month and a half since I had the accident. The leg is still in a poor condition but I thought I'd better go to the boat and get on with the work as the weather is not going to get any better and the repaired wood needs to be painted otherwise it might start rotting again.. So I hired a van, bought some plywood to rebuild the shelves on the starboard side, picked up a friend and headed for the boat. One of the reasons I hired the van (apart from the fact that I don't really want to ride my bike for any long distances) is that I wanted to take out everything from the boat and put it in some storage space so I can then inspect the boat and do my work in a bit more comfort. Currently there is so much clutter and junk in the boat that it's very difficult to work in there. In the end I didn't take out anything as there was a carnival in town and the road would close for several hours so we wouldn't be able to use the van to carry stuff to the storage space. Plus I thought of just moving the boat from its current location as it's not very convenient and is right on the high street and everybody can see me working on it so I don't feel very comfortable making noise or being very messy.. Anyway, my friend was very helpful and urged me to get our work done quickly. We sanded down the s/b side of the hull that I hadn't done the last time I was at the boat and then applied the antifouling. The whole process took about four hours. It could be done in a shorter time but the roller brushes we had were simply crap and I went through at least 5 rollers..
Another weekend at the boat, planning to do some major surgery to replace the aft beam under the mast step. My jack had arrived but as I was not sure it would be stable enough to lift the coach roof I borrowed an acro prop from the marina. I fitted that under the mast step and started lifting it but could not really move the coach roof even though I had slackened the shrouds. 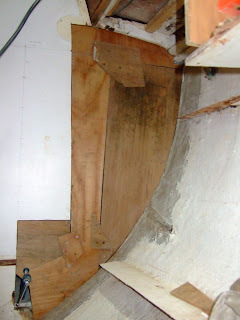 I did not want to put too much pressure though as I did not want to stress the hull over the keel. Anyway, I started cutting away the broken beam that came off surprisingly easily - it was all rotted. 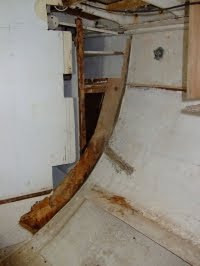 After removing a large section of it I discovered that the top of the bulkhead behind the beam has also rotted away. Oh dear - not another bulkhead job..
At the moment, my main concern is to keep the boat afloat. I have not been to the marina in 2 weeks and I'm slightly worried that I will find it at the bottom of the river or that the engine will be flooded. These are valid concerns as it has about a foot of water every time I go. Last time the manual bilge pump did not work so if the engine doesn't start, I'm slightly screwed as I don't have any emergency buckets on board..
Finding out about boat repairs became my latest obsession. As I frequently talk about obsessions here, I need to clarify that when I say obsession I do mean it: it's something I think about all the time and I devote almost all my energy to it, without necessarily achieving the desired outcome..as my obsessions come an go. Most of the research I did was online in an effort to minimise my expenses which are bound to mount if I want to make the repairs. I found out about the different types of wood: there's hardwood and softwood - I never knew about that distinction. Then I found out about the properties of different species of wood: teak, mahogany etc. I checked wood prices. Then I though tabout the tools I'd require. And the possibility of having to unstep the mast, which I do not like at all to be honest.. as it probably means that I'll have to take the boat out of the water. It was another cold morning. Emma and I arrived at the marina on my bike. This time I was hoping to have a proper inspection of the boat, although it was now too late to ask for my money back.When I opened the cabin hatch I was quite shocked to see that there was about a foot of water in the boat. Luckily I had my wellies on. First thing I did was of course to find the bildge pump. How does it work?! I couldn't find out how to start the electric pump. No problem I thought, let's try the manual. Where is the handle? Nowhere to be found! I found some other metal rod and started pumping. We must have been doing it for about half an hour when I decided to have another go at starting the electric one. This time I got it right. It was just a matter of flipping the right switches on.. In a matter of minutes the water disappeared. Good! The cabin looked much healthier now; just a bit wet though. Oh well. I was not sure whether I wanted to get the boat out for a little sailing. All my experience was 5 days of the RYA competent crew training and one more day of crewing on a friend's boat. I had never skippered a boat before, navigated, moored etc. But the adventurous spirit in me that keeps me going and often messes things up could not resist. Emma was slightly concerned.. And I must admit I was too. But what's the worst that can happen on the river Crouch with no wind at all? I started the engine, untied the mooring lines and off we went. The sensation was subtly mesmerising. I was skippering my own boat! It must had been around 4pm and the sun was nearing the horizon. The scenery on the Crouch was just beautiful. But the noise of the engine was disturbing the tranquility. Despite the almost complete lack of wind I decided to get the sails up. That's why I got a sailboat. And so I did. After taking off the mainsail cover and the ties I did struggle a bit to figure out which is the main halyard. Such was my experience on boats. When I finally did find it and after I created a bit of a mess with the other halyards/sheets, I looked up the mast with pride, joy and satisfaction..
..which instantly evaporated when I saw the blue sky through a 2 foot tear on the sail. But, he had said the sails were fine! Did he lie? Emma said she heard the sound of something tearing as I lifted the sail... I was disappointed for a while but then thought that it's not a biggie - it can be repaired - just another job to add on the list. So I unfurled the genoa and pretended to be sailing in the non-existent winds. The calmness drew us in and we drifted with the falling tide. By the time I realised it was getting dark we had already drifted quite some distance from the entrance to the creek where the marina was. And it was near low tide meaning that we may not be able to get in as the boat has a substantial draft of 5foot 6inches.. On the way back, against the tide, we were making little progress. It did get dark and we could barely see where we were going. At the creek entrance we must have had skimmed the mud as the boat started turning round instead of going straight. But we did not get stuck so we did not have to panic. But I have to say that I was quite worried. What with the darkness, the falling tide and my complete inexperience, so many things could go wrong. When we reached our berth I thought I'd have an easy time. How wrong I was. It's a finger berth facing the shore which at low tide is probably less than two boatlengths away. No problem, I thought; I'd make a 90 degree turn and then make a few maneuvres forwards and backwards and get in. And that's what I did. But when I tried to go backwards I discovered that the boat would only turn to starboard!! I was trying for more than 10 minutes pushing the engine hard but drifting away the more I tried. I thought it was the tide that that was too strong and prevented me from turning to port when going backwards. The engine was making a lot of noise and probably woke up our neighbour, two boats to starboard side.. Finally, I managed. I don't know how but I certainly was in a state of controlled panic. I got myself a bargain! Her name is Ting-a-ling. If you've met her before, please drop my a line.